Our society tends to hold people to high standards. It’s easy to feel like if you’re not always working on something productive and churning out perfection, you’re doing something wrong. If someone other than a child tells you they love drawing, singing, or playing soccer, you probably assume they’re accomplished in that area, right? Once you’re an adult, or even a teenager, there’s so much pressure to put your time into whatever you’re good at: whatever will earn you money or give you a positive reputation. Although it’s important to be productive and to continue working on skills we already have, why not do things we enjoy too, even if we’re not particularly good at them? Shop 'Goals: Inspiration Journal' here! As I’m sure you know, there’s a lot of awareness of the benefits of self-care, which people tend to think of as indulging in guilty pleasures or relaxing activities in order to take a break from a busy life. These things are definitely important, but you can also use the time to try something new. Sometimes I do see self-care advice about spending time on a hobby, but it often implies this hobby should be something you’re talented at and falls into self-care or ‘me time’ only because it’s unrelated to your professional life. But what about activities you’ve never tried but always wanted to, or ones you’ve always played around with but haven’t progressed very far in? If a certain hobby or activity makes you happy, or you’re interested in exploring it, go for it! Return to a forgotten childhood passion or pick up something new. You don’t have to feel pressure to become an amazing artist or singer or soccer player; you can just do it. There aren’t any ‘wrong’ ways to start a hobby or activity. An amateur writer may use too many clichés or an athlete may not use advanced techniques, but the thing is, who cares? Sure, if your goal is to become highly recognized, you may need to revise or adapt, but there’s no shame in doing something poorly. If you’re just doing something for fun, then it doesn’t matter if it doesn’t conform to certain conventions. Give yourself a break and remember to cut others some slack, too. If your goal is to improve, you simply have to do it badly for a while. No one becomes an expert overnight. When we start new things as teenagers or adults, it can feel like we should be good at it immediately. Have you ever known someone who’s so talented at a certain activity that it seems effortless, so you wonder why you can’t just do that too? Remember that learning takes time. It’s pointless to compare yourself to others; you’ll feel bad and you won’t get any better for it. Easier said than done, yes, but remind yourself of this. Besides, if a friend or family member is experienced with something you want to get better at, they should be supportive of your efforts, and maybe they can even give you some pointers. Let go of the nagging voice in your head and embrace imperfection. Regardless of whether your goal is to become accomplished in an activity or simply to have fun, it’s good for you to do things you’re bad at. Try to accept that it doesn’t matter, and you’ll relieve some pressure. If you’re a perfectionist, it’ll loosen you up a bit. If you’re shy or insecure, try to share your creation or performance with people you trust. It may be counter-intuitive, but it can be a confidence-booster to say, ‘Here’s this thing I did and it isn’t very good but it was fun!’ Of course, it’s always nice to share your life and interests with others in the first place. Let go of the nagging voice in your head and embrace imperfection. Do things simply because you enjoy doing them—you deserve it. It’s the only way you’ll get better, and even if you don’t, it doesn’t matter. 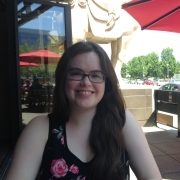 Allison is a rising senior at Hamilton College who loves reading, writing, and animals. She is majoring in Literature and minoring in Psychology, and she plans to go into publishing upon graduation.